Cushioning Systems in Packaging- What's the Point? Cushioning is a material or system used to reduce the shock, vibrations, or both that transmit to a packaged product from an outside force. In order to cushion, a material must deflect upon impact. This deflection allows the cushioned object to reduce its velocity to zero over a longer period of time than it would if it were not cushioned. Dunnage type material provides some cushioning on the first impact, but cannot be classified as resilient. Cushioning, on the other hand, is resilient which means the material can deform yet subsequently return to almost the same degree of shock reduction it offered on the previous impact. Cushioning acts as a shock absorber to prevent damage to the product. The cushion reduces the acceleration-time pulse, lowering the acceleration and spreading it out over a longer period of time. In order for cushioning to work, it cannot be too hard or too soft. If it is too hard, it will not deflect much, so high levels of acceleration will be transmitted to the product. If it is too soft, however, it will deflect so much that the cushion becomes solid and high acceleration levels will be transmitted to the product. Some of the most commonly used cushioning materials include plastic foams made of polyethylene, polypropylene, flexible polyurethane and copolymers of polyethylene with polystyrene. Many of the systems made from these foams include fabricated foam parts, molded foam parts, molded foam-in-place, shock mounts (elastomer), helical isolators, blow-molded toroids (Corner-Mate™ for interiors and Skid-Mate™ for pallets), Korrvu™ suspension pack, and Cradelair™ pack. 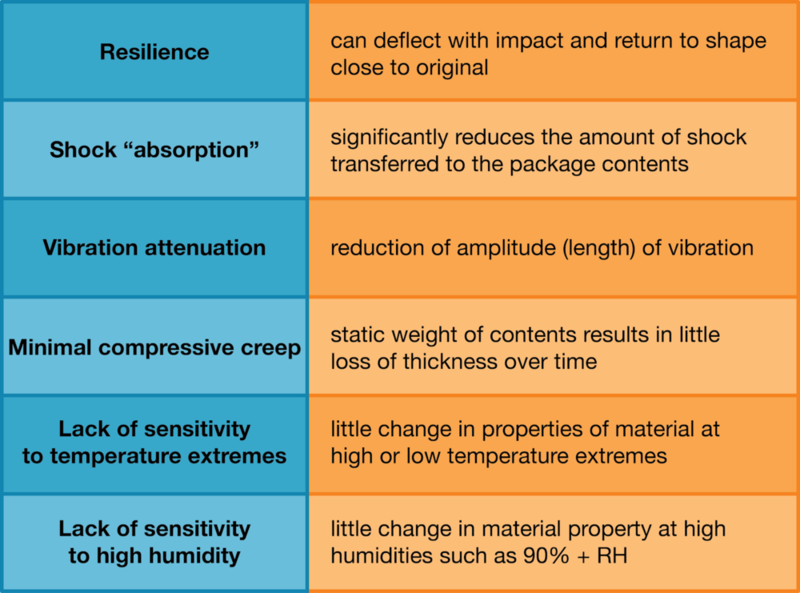 All of these materials are resilient and suited for protecting fragile products from repeated impacts against the same surface. Vibration performance of cushioning materials is measured by using vibrational inputs over a range of vibration frequencies that are typical of the transport environment. Instrumented test blocks are placed on the cushioning material to display resonant frequency characteristics that are useful for packaging designers. Cushioning systems are an important component of packaging to protect products throughout the distribution system. As always, you must know the conditions your product will endure to determine if a cushioning system is a viable option for your packaging system. Check out our Packaging Distribution course to learn more about cushioning systems. Newer PostHow Recyclable is Metal, Really? Older PostHave You Done Your Research?